(I saw a lot of people taking photos of this car at HIMSS 2010 and HIMSS 2011). Farmington Hills, Michigan – March 7, 2011 – Reliance Software Systems, Inc. (RelWare), a Michigan-based healthcare information technology company, raised greater than $1000 for TEAM FOX during the recent 2011 HIMSS Conference and Exhibition in Orlando, FL. This contribution directly benefits the Michael J. Fox Foundation for Parkinson’s Research. 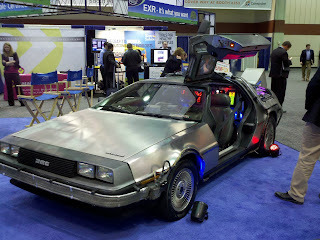 For the second year in a row, RelWare featured the Back to the Future DeLorean Time Machine in its booth to raise awareness for TEAM FOX, and as a symbol of RelWare’s technology—a “Roadmap to the Future”. For a personal picture with the Time Machine, attendees were asked to make a donation of any amount to TEAM FOX. Team Fox was launched in January 2006 as a way for The Michael J. Fox Foundation to support the heroes all over the country who already had made it their personal mission to find uniquely creative and fun ways to raise funds for Parkinson's research. Team Fox provides guidance, tools and resources for the thousands of amazing people all over the world who are walking, running, baking, party planning, paddling, pedaling, and dancing to raise funds and awareness for Parkinson's research. Since 1998, RelWare’s corporate goals have been to provide a quality-driven, reliable, affordable, web-based EHR to healthcare. A focus of the product is incorporating thin technology with emphasis on usability and flexibility in workflow to meet the individual needs of every user. RelWare makes the difference through advanced, consistent software solutions and successful, implementation-driven service. RelWare and EXR: it’s what you want. To learn more about RelWare, visit www.relware.com. HIMSS11 coverage is on MedicineandTechnology.com is sponsored by HP and Practice Fusion. HP’s extensive portfolio of products, solutions, services and relationships can help your healthcare organization achieve quality business practices and provide quality patient care. Practice Fusion's free EHR is the fastest growing Electronic Health Records (EHR) system in the US.